I never thought horses could teach me about how I act in relationships and in my life, until yesterday. 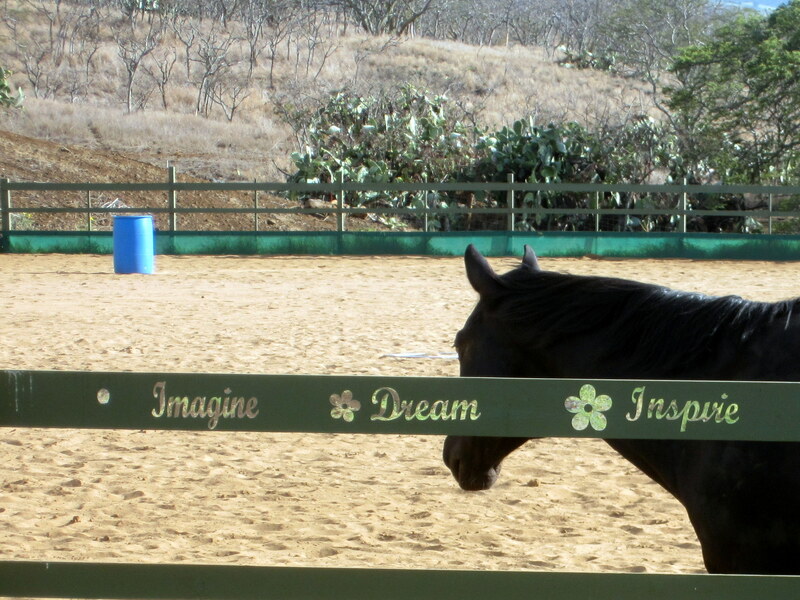 We were introduced to equine therapy, and I was amazed at the insight gained in just a short hour session where I observed our therapists interact with the horses. There were three horses loose in the arena, meandering gently amid the therapists, and coming over to the fence to take the grass we offered. For one exercise, the participants were given clear instructions. Each had a hula hoop. They had to stay within their hoop at all times, and the goal of each person was to get the horse of her choosing come to her and walk around her. She couldn’t talk, or bribe or touch the horse. There were tools in the arena that could be used. My mind pictured someone standing in the middle of the hoop, somehow beckoning the horse to her. How on Earth?? When another person asked if they could hold the hoop and move around the arena, I realized that my mind had imposed limitations on what can be done. There were so many possibilities that my mind had not fathomed! Many of the participants stayed in place, or only moved a bit. A couple of them finally worked as teams. Not one of them did any hula hooping, even though one looked like she really wanted to play with the hoop. Not one of them used any of the tools, such as a bridal, a bucket, and a large ball. I had not even thought to use those, although they were mentioned in the beginning. I was amazed at how many restrictions the participants imposed on themselves. And it really meant that they didn’t explore all the options. So much energy was put into wondering if this or that was OK to do. But there were only three rules! Keely waiting for the session to start. I often have waited for my partner to take the initiative. 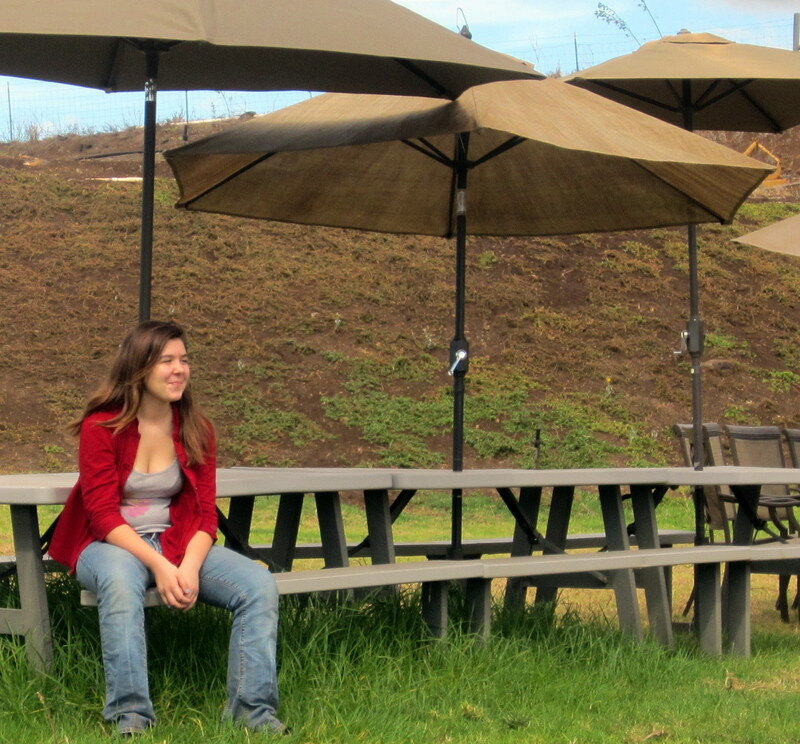 Too often, when I did, I got shot down (in my mind), but really I was waiting in some weird way for permission. WOW! So often, I sought outside affirmation that what I was doing or wanted to do was OK. I couldn’t just trust that my gut instinct was right. What ended up happening is I learned to delay following my dreams, delay gratification (not in a conscious way), negate my true feelings until I had “permission.” For someone as independent as myself, it is very weird to come to this realization. What self-imposed limitations do you put on yourself? When you “should” yourself, that is a time to look closely at what is really going on. Today, I give myself permission to do what I feel is right, to allow myself to follow my gut. I urge you to do the same. We passed the pink hat around, and I was dismayed it was so small, but I relished it nonetheless! 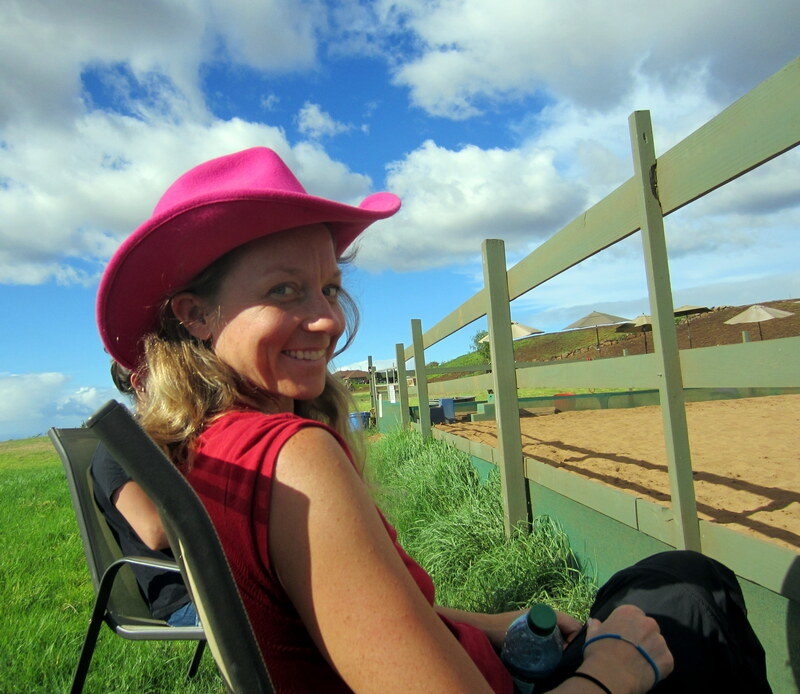 This entry was posted in Career, Emotions, Health, Hoop dance, Mind-Body Awareness, Nature, Parenting, Relationships and tagged equine therapy, horses, intimate relationships, maui, ohana ranch, parenting, permission, positive affirmation, psychotherapy by AmyRxBaker. Bookmark the permalink.